For some reason, this year, I found it particularly difficult to take the Christmas Decorations down. Once they were packed away, our house felt so depressingly empty, probably because all the kids had left to head back to college and jobs and the gap left by the celebration of Christmas seemed cavernous. January is always a grim month in my estimation, so I decided that it was time to brighten it up with something new. On twelfth night, with my husband also away with work, I headed into the sewing room early evening. Like a lot of my fellow stitchers and quilters, I love looking on Instagram for inspiration and ideas and always have a 'to-do' list floating around in my mind. I had seen a few absolutely beautiful Red and White quilts posted up there in December and of course, being a 'Ruby' kind of gal - this idea was way up there near the top. 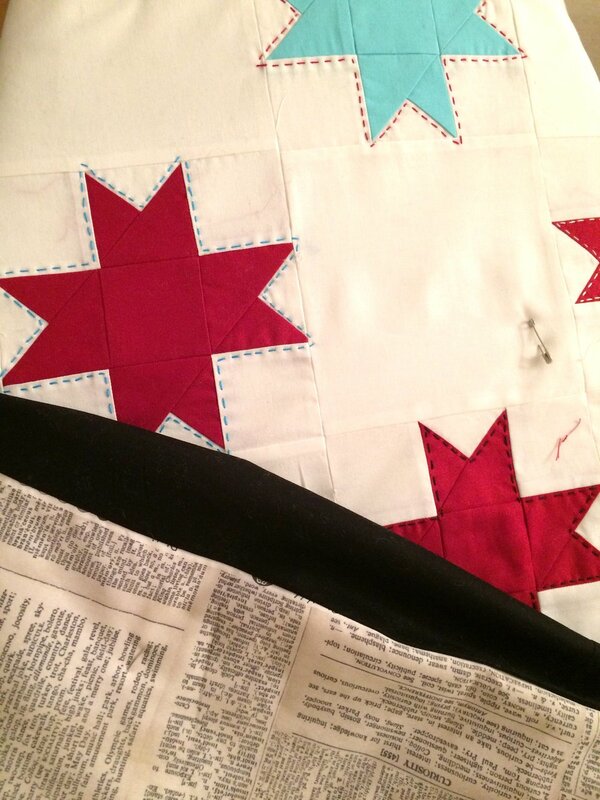 So on this dark and chilly winter's evening, when I was thinking about what to make, red stars were in my mind and very soon on the sewing table. I used Camille Rosekelley's pattern 'Candy Stripes' and simply made star blocks in Kona Ruby Red and Bleached white. It was addictive. I got a production line going - chain piecing and pressing all the way along the line. It took a couple of evenings to get it all together, with Basil's help, of course. As I was going along, I laid the little squares out on the floor in the sewing room and the more it grew, the more I got tempted to add in a couple of colour pops, to tie in with my little patchwork cushions. I added one 'teal' star and two 'aqua' ones. It looked super pretty. Once I had joined these altogether, my little quilt was so cheerful. It was so plain and simple and crisp and clear and I was almost tempted to hand quilt it, to give it a sort of prairie look. In the end, I decided to outline or 'in-line' the stars with a simple running stitch in Perle Cotton #8 to give it lift, before I quilted it. I stuck with the colours of my kitchen - red, aqua and black (because of the granite work surfaces). I actually loved doing this handwork and the effect of it. It gives it a hand quilted look in quick time. For the backing, I used a newsprint fabric, to keep the colour scheme and to give the idea of chilling and reading the newspaper with that early morning cup of tea. I love text print fabrics - they are versatile and easy on the eye and add a little modern twist to a quilt. With the quilt layered up, I felt a sort of 'Starbucks' aroma take over the piece. The quilting was the best fun though! I felt that with so much open space in the quilt, it was important to add texture with dense quilting. In fact it seems to me that a quilt in the kitchen has the potential to get grubby and I find if you use a lot of plain light colour in the background, the dirt seems to cling to it. You notice it less with all the design work in the stitches and the whole thing seems alot more friendly. Because this is just a small quilt, it was easy to manoeuvre in the sewing machine, so I had some freedom to experiment. Once all this was done, I added a border of Liberty fabric to match the kitchen window blinds. I called this the 'Twelfth Night' quilt and it has already served it's purpose in one way. It cheered me up in those first weeks of the year and now that February is ushered in, the January blues have vanished. Having lived in cold countries, Russia and Stockholm, I am not averse to winter. I loved the explosion of hats and coats in every kind of shape and size and material on the streets of Moscow once the snow came and those bright, crisp icy Stockholm days were simply beautiful. The Swedes have a saying 'There is no such thing as bad weather...only bad clothes' - I love that. Winter days are for baking, making soup, lighting candles and snuggling up with hot drinks and good books. Now our kitchen is a place to do just that. Oh and just before I go...I have also been trying my hand at painting some wooden patchwork blocks - check back next time to see all about these. Here's a little peek.